When it was decided that Zend's Optimizer Plus would be merged into PHP, APC was already in a pretty poor state, there hadn't been a stable release for quite some time. We were moving towards having a built in (abandoned in php-src/ext) opcode caching solution but it was not obvious that APC was going to keep being maintained. I think all of us assumed that the bugs that were being experienced were entirely down to the opcode caching parts of APC, since they were the most complex and most frequently altered parts of APC. So, one day (few nights), I stripped APC of opcode caching. One of the things I decided I would tidy up was the implementation and usage of locking. I'm going to assume that everybody reading knows what this is, and even without experience, can sense that it is probably the most inferior in the list. I sincerely hope that nobody uses file locking today. The reason it exists is because people deploy PHP in all kinds of places, places we don't get to hear about until something goes wrong. Those places might not have support for anything other than file locking, so it stays. This is your most basic kind of synchronization. Mutex means Mutual Exclusion, so we know that this kind of synchronization is exclusive. Read/Write locking allows a shared lock to be acquired for reading, this means many readers can be supported without exclusion. An exclusive lock is only required for writing. Speaking as a programmer who spends a lot of time writing multi-threaded code, in various languages: A spin lock is about the worst kind of synchronization imaginable, it is basically a predicated busy wait loop. This remains in APCu for the same reason file locking does, and I actually have heard of people using it and can't convince them to do otherwise. I didn't know the APC code base before that first night, had never read any of it before. Whenever a programmer reads code from a prospective project that another programmer wrote, they have criticisms. Some of them are just our ego talking, some of them are wrong, some of them are probably a mechanism to motivate us to keep working. Hardly any of them are worth mentioning, or doing anything about. The task at hand is to get the thing working, not fix every problem that nobody ever had. So I cleaned up, I worked on it for a few days and pushed it to pecl. So, this blog post started out as something completely different. APCu was demonstrably unstable, and I thought this was because it broke a basic rule. It seemed to acquire a read lock, when it should be acquiring a write lock. There seemed to be a clear path to race conditions, in other words. The APCu version omits atomicity, it omits safety; In my haste to clean up, I have made a horrible mistake. There was even a pull request, from one of the elders of PHP, that I chose not to merge, for three years. The worst thing about being wrong is that I inevitably feel dumb as rocks. The best thing about being wrong is things that didn't make sense before, like this, or this, and many other bugs besides, start to make sense. So, I've found the reason that APCu was unstable, it was me. This probably caused a problem for a fairly large number of people. APC(u) has had stampede protection for a long time, however, it is perniciously named, and ineffective when it is most needed. You are most vulnerable to high load when the cache is empty, because the work you were trying to avoid executing unnecessarily by caching it's result, must execute. The problem is that the expensive-work-worth-avoiding is going to be executed in more than one process; It will be executed by however many processes you are using that are able to spin up in the time it takes the first process to warm the cache. If you have large pools of processes, or generation of the entry is expensive, this becomes a very real problem. 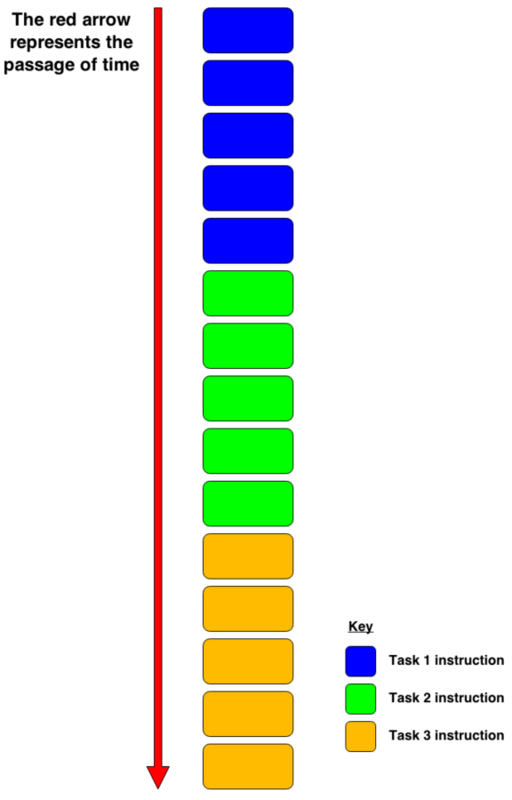 The stampede protection built into APC(u) only stops a stampede of the cache, it doesn't stop the stampede, or competition, for CPU time while dozens, possibly hundreds, of processes are attempting to execute the very same code paths, only to fail to store the data, because the current stampede protection will prohibit the write, for most of the processes anyway. The most obvious, but most dangerous solution would be to expose a lock and unlock function to userland PHP. If some process calls lock, and before it gets to call unlock, experiences an uncaught exception, or some other fatal error, it will deadlock the server. Since so much can result in that kind of fatal error, it doesn't seem worth the risk, considering the price of failure is catastrophic deadlock. If the entry identified by key cannot be found (or is invalidated by the ttl it was stored with), generator is called and the result stored with the optionally specified ttl. All of this is done while an exclusive lock is held on the cache; This means that if many processes hit the same code path, only one of them will carry out generation. Recursion is only natively supported when rwlocks are disabled (--disable-apcu-rwlocks) at build time, it is otherwise supported with a thread local counter. Fig 1. A priceless artefact from antiquity. Humans are a terrible bunch; Give them ancient, priceless artefacts to care for, and they'll snap the beards off them and stick them back together with pound shop (99c store) epoxy. In August 2014, that literally happened. Apparently, the museum has world class conservation equipment, and experts. So repair was carried out internally, at the museum. 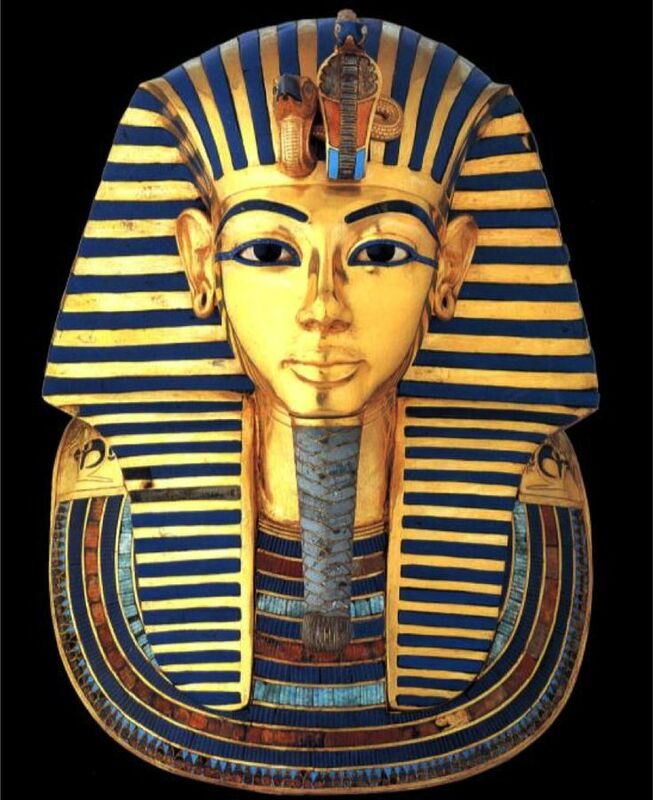 Imagine that you were responsible for advertising for the job of "Repair Man for King Tut's Beard". What would that advert look like ? Using just the features of blogger, I have conveyed everything important about the problem with a picture and a few words. The words could have been almost anything "Help Required with Broken Things" would have done the job. Every one of us depends directly on code that was authored by somebody else. That may have always been the case to some degree, but in the modern ecosystem, we can directly contact the authors the majority of the time; We can open a bug on github, or some other bug tracking software. Directly interacting with the authors of some code, so quickly, and with such little effort, feels pretty new to me; a product of our collaborative ecosystem. Another, less obvious product, might be the programming language barriers that are erected by interactions between ecosystems that support, mutually or otherwise, other ecosystems; Such as the internals ecosystem which speaks in C, and the userland ecosystem which speaks in PHP. Language barrier or not, we appear to make assumptions about the authors of some code, that we know are not true for code that we have authored ourselves. Our bug reports and questions can tend to have content that amounts to "Help Required with Broken Things". If a bug is caused or effected by configuration or environment, then that's important information, however it is rarely enough to describe the configuration, environment, or even content of your code. In the cases where only description is enough, it is obvious. In cases where we think code is paramount, we are mostly aware. What we are not always sure of, is how to include "our whole application" in a bug report, or question. Stackoverflow has an excellent description of what reproducing code should look like, and even how to create it. We don't live in an ideal world, and we can't always create MCVE's. I don't want to discourage anyone from reporting bugs or asking questions, at all. 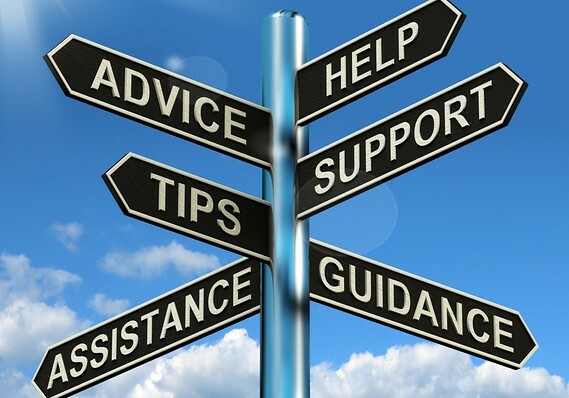 So, open your issue, report your bug, ask your question, with whatever information you have. But, you already know that it may not be actionable until it contains a MVCE. A worthy observation is that in the course of trying to create an MVCE, you will, at the very least, find that you are able to describe the problem in more and more detail. Trying can either lead to reproducing code, or the kind of detail that might make your query actionable. I've written on my blog, spoken in my talk, told strangers on the train: You should not use multi-threading at the front end of a web application, it does not make sense when the threading model is 1:1. Regardless of the fact that I wrote pthreads, and I know very well what is suitable and what is not, my advice is ignored: I get endless bug reports and questions with example code containing HTML line breaks, and reports that Apache or FPM is not behaving itself. You ruddy well will listen to me, this morning I released v3.0.6 of pthreads and it disables the ability to load pthreads anywhere but the CLI. When I first wrote pthreads, I wanted the barrier to entry to be low. Years later, I can see clearly that was a stupid thing to aim for; The barrier to entry is not low no matter what I do. I thought it's no big deal if someone wants to use pthreads in their webserver, pthreads uses all the right API's it should be safe, even if it's not a good idea. I was totally wrong. It's not safe, and never will be. When I say safe here, I don't necessarily mean safe in the re-entrant, thread safety sense. What I mean is logically sound, which includes safe in the concurrency sense of the word. Rather than trying to focus on making pthreads accessible, I have switched my focus to making pthreads v3 robust, reliable, predictable. These are the things that are really important when you are writing multi-threaded code, ease of use or accessibility shouldn't even be on the list of things you want a multithreading API to be. I think, I can claim a modicum of success, even though v3 is not widely used yet. Code that didn't work before, or behaved strangely, just works now. pthreads is faster, it's simpler internally. It is more accessible and easier to use. But, not because I aimed for those things, but because I aimed for predictability. All the while, people were still able to ignore probably the most important piece of advice I ever give. Many such questions can be found on stackoverflow, the best answer isn't always the accepted one. People tend to accept what they wanted to hear. EJB's expressly prohibit the programmer from creating threads by specification, and modern Java doesn't even have a 1:1 model. Obviously, this is mostly because the environment may be migrated (moved within a cluster of servers), moving threads outside of it's managed pool is difficult to imagine. It goes further than prohibiting the creation of threads though, it prohibits the use of synchronization primitives, because what if a node is moved while you retain a lock - all hell breaks loose. In Java generally, you are discouraged from manually creating threads in Servlets, for all the same reasons I have discouraged it for pthreads. While it's true that not every environment will actually prohibit it, it runs as deep as can be; Everyone agrees that creating real (1:1) threads in a web response context is a bad idea. If you're creating threads inside your multi-process, multi-threaded Apache environment, and you see this as a restriction, you're wrong, just like I was wrong to allow it. 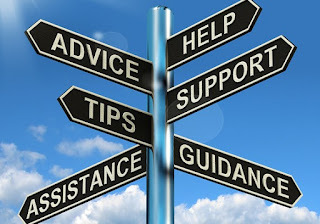 Advice is, quite obviously, only worth something if you are going to listen to it. It's okay to be wrong, it's an opportunity to learn, to do things the correct way ... take the opportunity. Slowly but surely, this has become part of the PHP vernacular, everyone has heard of password_compat. 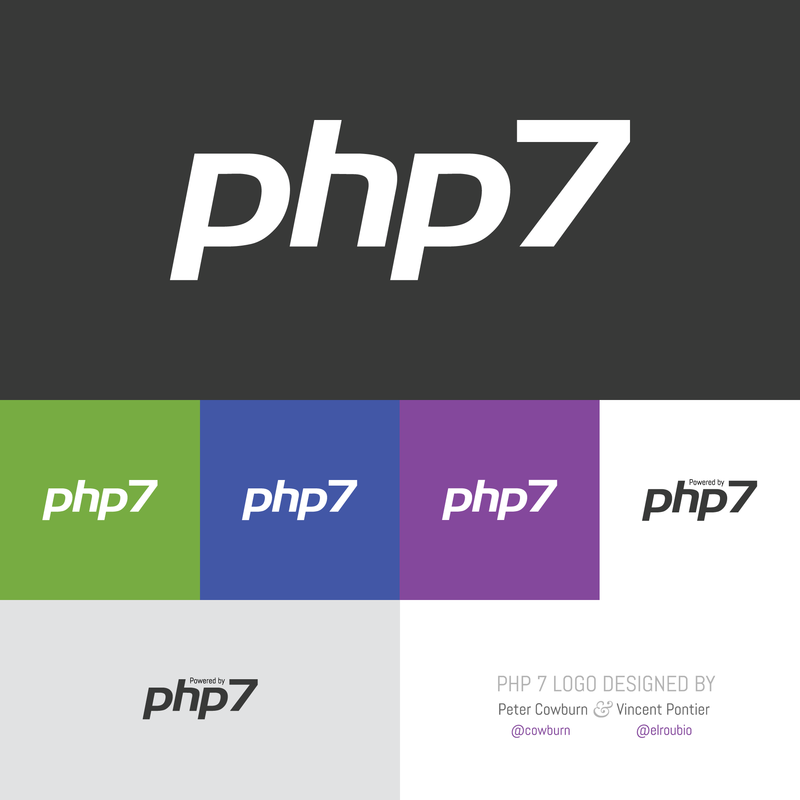 A polyfill for PHP7's random_* API is also available. I think we know what a polyfill is, or can skim the definition ... because I'm going to keep using that word. Recently a fellow githubber opened an issue for pthreads, they are writing a static analysis suite for PHP, and are attempting to integrate pthreads into their code. First thing to say is, I don't know where that will lead him. But it does give him the problem that a lot of environments don't have pthreads available, and or they aren't using a thread safe interpreter. In the issue, he made the suggestion that we have a compatibility layer, a polyfill. I confess, this had never occurred to me before. Not only does it solve his problem but it actually serves as a useful tool ... I shall explain. I'm often asked the question "what is a good use case for threading?". I'll stare open mouthed at the asker, or squint and tilt my head awkwardly in response. In a way it's like being asked the question "what is a good use case for objects?". I'll go on to try to explain this is some awkward way, never really knowing if I am making sense. I can't answer that question, it doesn't really make sense. Maybe someone can, but not me. 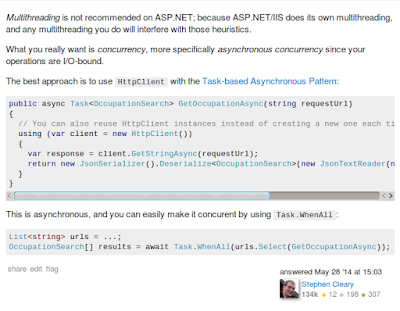 A question that does make sense is "what kind of code lends itself to threading?". To this we can give a pretty good answer. First we can make the assumption that your are only considering threading because you have a lot of work to do, if that's not the case, do something else. Assuming there is a lot of work to do, then whether you have the kind of task that could gain anything by using threads depends on the nature of the work. This seems kinda obvious, but if every detail is explained, then more people will understand, I think. You can be pretty sure that you have a good candidate. These basic guidelines are extremely useful. Good multi-threaded code avoids synchronization, because there is too much margin for error and the unexpected, even with the best API in the world. Even with the best API, and the best programmers, synchronization (which must occur for units of work to communicate) diminishes performance, creates contention for locks, and is generally a bad thing. If you are not dependant on the order of execution, you could (and at some point might have to) write your own scheduler (Pool::submit) to exploit hardware, and your software, to the fullest. If you know enough to see the cases where those rules can be broken, then you don't need my help and can stop reading, I bid you farewell and good luck. If you are still reading then I must be making sense, so we will now look at how you can use the polyfill as a tool. New Rule: Training Shoe Slogans Are Always Wrong! When it comes to researching multi threaded php, you should not "Just Do it". In fact, there are very few occasions where such an attitude would be advisable, so, new rule. If you think you have the kind of code that can take advantage, then you should test the waters. Before you change your PHP installation, or development environments, you should try to write your code using the polyfill. When you start to win, and you have things the way you want them, you can load pthreads. Save for final optimization for real threads, reducing synchronization, and communication with non Threaded objects, if at this time you do not see a visible benefit, the best advice I can give is go in another direction. Throwing threads at any task doesn't necessarily make it faster, and if at this early stage in development you are not seeing a visible benefit, then in all likelihood, there isn't any benefit to be had, simple as that. If you do see a benefit, then you don't need to be worried about deployment problems and dependency on pthreads, if pthreads is available the units of work execute in parallel, if not, they don't. Everything works in a predictable way, everywhere. My final words should pay homage to the observation that the best ideas aren't always our own, I'm really grateful when fellow programmers try to engage on github, or by any other means. They don't have to do that. So, thank you ovrweb for taking the time. 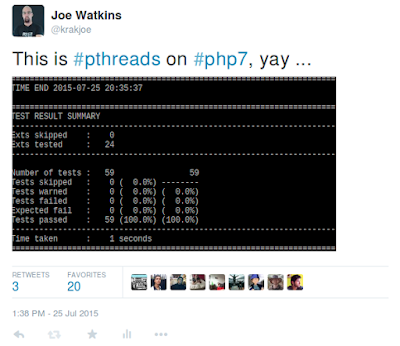 A couple of weeks ago, I wrote about my efforts to port pthreads to PHP7, to make it worthy of the shiny new platform. Work continued on pthreads, and today I'm going to take the opportunity to update my previous blog post with some correction and extension. With PHP7 in RC2, I'm sure everyone is a bit tired of blog posts about how quick PHP7 is and why it is so quick, so we're not going into that today. We will be looking at the performance of pthreads in particular. Last time I wrote about v3, it was still under development, and while the pthreads test suite passed, complex code of the kind you cannot include in an extension test suite didn't work as expected. I knew about it at the time but we were talking about untagged, unreleased code. Note that we are still talking about untagged, unreleased code. However, this is only because the route to release is not very clear for PHP7 extensions yet, with no pear/pecl support. 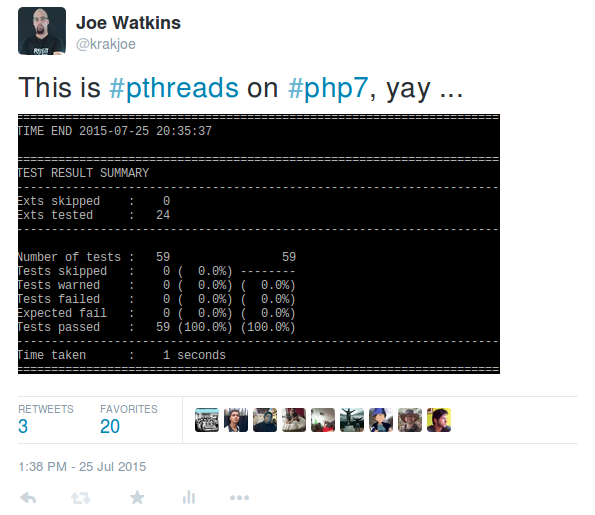 I previously wrote that you would be able to serialize Threaded objects like any other in PHP. I have to retract that statement; I overlooked the fact that a serialization hack is required to make Threaded objects behave as expected when they themselves are members of objects which are not Threaded (and so are serialized). So, the hack got put back in, a bit tidier this time, and is used much less frequently than before, because no need for serialization of Threaded objects when they are members of other Threaded objects. Note that, Threaded objects are still not serialized, only the serialize/unserialize handlers manipulated to pass around the address of an object, rather than a serial representation of the objects value. This has been improved yet again, we don't waste the memory to copy the set of keys as I previously said we would. Now we just iterate over the store copying keys and values as they are required for iteration, safely, obviously. This couldn't be more efficient, nothing else to say about that. It's going to be obvious that a Threaded object has quite some overhead associated with it, in order to provide implicit safety, store in a thread safe manner, and synchronize at the programmers will. What might not be obvious is just how many hoops pthreads has to jump through so that a programmer can manipulate one object in two contexts. You cannot actually have an object in two contexts in a shared nothing environment, so that's the first thing to observe; There are actually O(n) objects where n is the number of contexts with a reference to the object. Whenever $this->member is accessed in the thread, if you don't know that another context didn't change the reference, you have to undertake an enormous amount of work to provide the new context a reference to $this->member, at worst a new object is constructed every time. 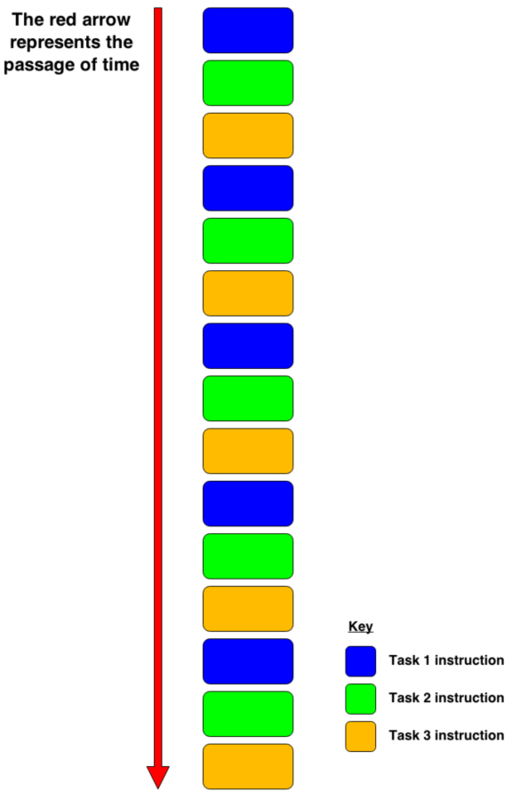 In later versions of pthreads v2 there was a mechanism to reduce the number of constructions but it wasn't wholly effective, it leaked memory, with no chance to plug the leak. So this mechanism was removed from pthreads v3. This means that not only are there O(n) objects where n is the number of contexts, but they must be constructed O(n) times where n is the number of accesses to the object in another context. For normal objects, objects that are not Threaded, we have little choice but to put up with the performance overhead of that. It should normally be the case that objects being used by Threads are Threaded, so this isn't much of a concern. For Threaded objects though, this is just unacceptable. In pthreads v3, setting a member of a Threaded object (A) to another Threaded object (B) makes the reference that A holds to B immutable. This means that during execution, once a member is set it cannot be unset or reset by any context, this means that the complexity for access is no longer O(n) but O(1). Note this is a late version of pthreads v2 with the aforementioned poor mechanism to reduce access complexity. Now that is more like it !! A wise person once said "Never trust a benchmark you didn't fake yourself". What we are looking at here is not really the time elapsed, for that will vary so much depending on so many things. We are interested in the number of user instructions executed because regardless of how long it takes, this gives you a good idea of how complex some user code is for the CPU. Not only does immutability reduce the complexity of access considerably, it also allows us to avoid synchronization after the first access to $this->member in the new context. We can do this safely because we already have a reference to the object, constructed (synchronized) on the first access and stored locally to the thread and object, and we know that the reference is immutable. Immutability breaks backward compatibility, but as mentioned, I don't care about that if I'm breaking something stupid or bad. It pains me to say it, the amount of effort I put into making pthreads work is completely unreasonable, but it was both bad and stupid. It may not seem like it initially, but immutability will become your best friend, very quickly. Fig 2. The definition of volatile, for reference. An object that might change while being manipulated in many contexts is the epitome of volatility. pthreads v3 introduces volatile objects to replace objects whose Threaded members are currently mutated by many contexts. 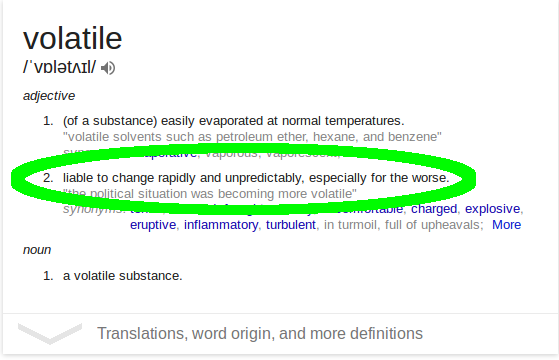 Volatile extends Threaded, so a Volatile object set as a member of a Threaded object still creates an immutable reference to the Volatile object, which is desirable because of access complexity, but the Volatile object itself is ... volatile. Volatile objects are slow, with high access complexity, and should only be used when there is no other option. 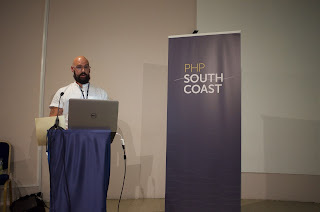 Nothing is without cost, it's arguable that multi-threaded programming in PHP just got harder to understand, but it is without question that it got so much faster that the set of power PHP programmers that use pthreads are not going to care.